We had a Valentine's Party at work today. I brought a very un-original and totally "safe" platter of veggies and dip (not all the veggies are pictured, I had to transfer to a bigger plate - HA!). 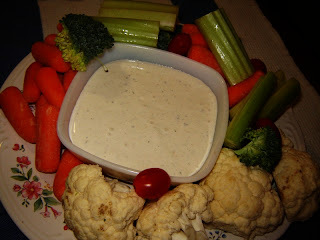 I made my favorite "Cashew Ranch" which is totally vegan and even RAW... No one questioned it or squinched up their nose, in fact the dip bowl was licked clean (it looked like it anyway... odd...). Must have passed the "picky omni" test once again. Happy Hearts day to each of you! Happy Valentine's Day to you as well! That looks like a great antidote to all the sugary stuff floating around. yeah, that dressing was good. there are no words for how good this dressing is!